Your day-by-day itinerary now includes Paradise Jet Boating as well as Jet Ski Safaris. Step out of Gold Coast with an excursion to Cape Byron Lighthouse in Byron Bay--about 1h 25 min away. There's lots more to do: get up close and personal with brilliant marine life at Sea World Theme Park, get outside with Pelican Feeding, get to know the resident critters at Currumbin Wildlife Sanctuary, and get in on the family fun at Warner Bros. Movie World. Brisbane to Gold Coast is an approximately 1-hour car ride. You can also take a bus; or take a train. 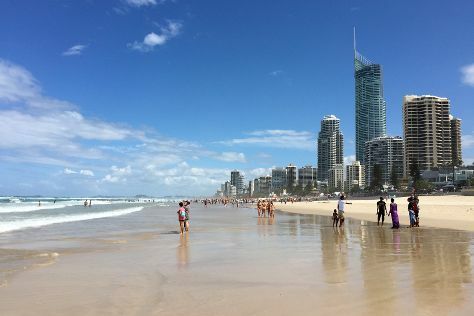 In July in Gold Coast, expect temperatures between 24°C during the day and 11°C at night. Finish your sightseeing early on the 25th (Thu) so you can drive to Brisbane. Kick off your visit on the 26th (Fri): take in nature's colorful creations at Roma Street Parkland and then let little ones run wild at South Bank Parklands. Get ready for a full day of sightseeing on the next day: look for all kinds of wild species at Lone Pine Koala Sanctuary, then get great views at Mount Coot-tha Lookout, and then get in on the family fun at Wheel of Brisbane. 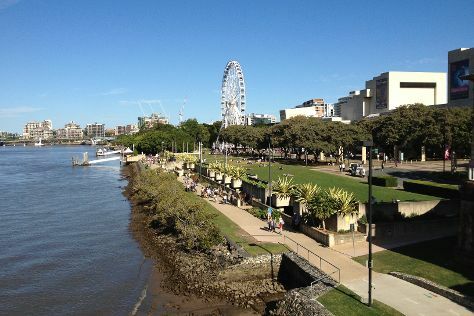 For traveler tips, reviews, other places to visit, and tourist information, refer to the Brisbane day trip planner . You can drive from Gold Coast to Brisbane in an hour. Alternatively, you can take a bus; or take a train. In July in Brisbane, expect temperatures between 24°C during the day and 11°C at night. Finish your sightseeing early on the 28th (Sun) to allow enough time to travel to Tangalooma. Originally a whaling station, Tangalooma Island Resort (formerly known as Tangalooma Wild Dolphin Resort) is a resort on the west side of Moreton Island in Queensland, Australia. On the 28th (Sun), head outdoors with Tangalooma Island Resort Dolphin Feeding. On the 29th (Mon), you'll have a packed day of sightseeing: enjoy the sea views from Cape Moreton Lighthouse, step off the mainland to explore Moreton Island, and then make a trip to Tangalooma Wrecks. To see maps, reviews, traveler tips, and more tourist information, use the Tangalooma trip planner . The Route module can help you plan travel from Brisbane to Tangalooma. July in Tangalooma sees daily highs of 24°C and lows of 11°C at night. On the 30th (Tue), you'll travel back home.